Under the crazy presumption that a roll of duct tape has to exist somewhere on the Mars facility, the Duct Tape mod sticks flashlights to your machinegun and shotgun. 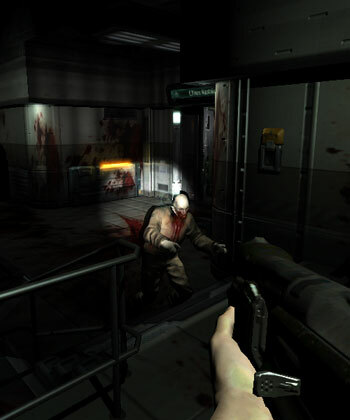 In order to preserve the atmosphere, these new lights are much narrower (and a little brighter) than the standard flashlight, and are only available on the basic weapons. The pistol is not equipped with a flashlight, so as not to spoil the early sections of the game. A readme.txt within the archive contains installation instructions. 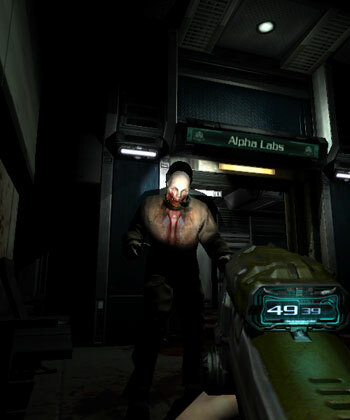 Note that the file now contains files for both Doom3 1.3 and Doom3: Resurrection of Evil. For Doom3 1.3, copy the pak008.pk4 file into your /base folder, for Resurrection of Evil, copy the pak002.pk4 file into the appropriate folder (no idea what it's called as I don't have it). Be careful not to overwrite your existing /base/pak002.pk4 folder. Increased compatibility with other mods, specifically ones that modify the flashlight (Thanks Joe Vaughan). Fixed bug where weapon would show a brief flash of light before beginning animation. Changed gunlight to have a tiny bit of haze. Minor release to increase compatibility with other mods. No functionality has changed. Fixed bug where new light wasn't casting shadow. Created new light map - cone is now much narrower than the flashlight's, but also a little brighter. Makes the flashlight viable again, as it provides a less claustrophobic viewpoint. By popular request, light added to shotgun. Duct Tape was downloaded over 80,000 times in the first 24 hours of its release (not including downloads from the mirrors at various mod sites). A toggle to turn the light on and off is coming. Perhaps. Not adding the flashlight to all the weapons is also intentional (see above). The Doom3 SDK is not available - all you need to create mods like this is in the .pk4 files (use an unzip utility on them). It's a mod - that it changes the game to something not intended by id is a given. Most find the game more fun using it, you may not. (amounts below US$1 generally get swallowed up entirely by credit card fees).